"A great appetizer that will sure to be a hit and tradition for parties to come!!" In a medium bowl, blend cream cheese, milk, green onions and prepared horseradish. Gradually mix in crabmeat. Chill in the refrigerator until serving. 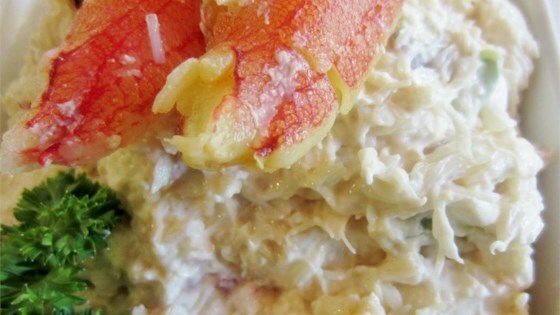 See how to make a hot and creamy crab dip served in a bread bowl. I thought this was great!!! I made the dip just as directed, spread it in a pie plate and poured cocktail sauce over the top. I was wonderful!!! Fast and easy for sure, but taste wise it was just ok. I won't make it again. This recipe was very easy to make. Living in the Chesapeake region I had to add Old Bay seasoning to it and it was great. I served it at a Christmas party for 32 people and everyone enjoyed it. I wish I had heeded the advice of the other reviewers who said this was not a good recipe. It was very bland, and pretty much just tasted like cream cheese. I do not recommend making this. This is so good and easy, it was a big hit at my last party, everyone wanted the recipe. I made this dip for our New Years Eve party and it was a hit. I had to give out the recipe to some of the guests. I'll definitely make this again and again. Wonderful, wonderful!! Huge hit at parties! Thanks!